ANAHEIM, Calif. -- All season long, the Gonzaga Bulldogs have been in the top tier of college basketball through their elite offense. They ranked No. 1 in offensive efficiency, per KenPom.com, scoring 125 points per 100 possessions. They upset No. 1 Duke in November by hanging 89 points on Zion & Co. They scored 100 or more points in five games this season. Brandon Clarke, their NBA-bound small-ball five, was one of the most efficient scorers in college basketball, scoring on more than 70 percent of his field-goal attempts. They moved the ball around their balanced lineup as well as any team in college basketball. But in Thursday night's Sweet 16 72-58 win over a big, physical Florida State team -- a game where Gonzaga never trailed -- they did it in a completely different way: they out-defensed one of the best defensive teams in the game. They brought Mark Few to his third Elite Eight in five years. And they did it on the backs of the frontcourt trio that could lead Gonzaga to its first national title: potential NBA lottery pick Rui Hachimura, potential NBA lottery pick Brandon Clarke, and likely NBA draft pick Killian Tillie. It's the most well-rounded frontcourt in college basketball. Hachimura out-physicaled the big, physical Florida State frontcourt, scoring 17 points and grabbing four rebounds while playing strong defense. Clarke showed why his future as a do-it-all small-ball NBA big is so incredibly bright: 15 points, 12 rebounds and five blocks. And Tillie gave the Zags a floor-stretching element, hitting one 3-pointer but opening up lanes for his teammates to drive, and creating space for them to hit their own 3-pointers. "I have the full package in the frontcourt," senior point guard Josh Perkins told me after the game. "An athletic guy who can switch one through five and catch lobs above the backboard, a pick-and-pop guy who makes every [3-pointer] he shoots and also can switch one through five, and Asian Persuasion, who has all-around game. They check off every box as far as bigs and as teammates. They kind of make me look good." 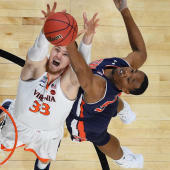 While Hachimura has had the hype around him all season long -- it was Hachimura who was selected to the preseason All-American teams -- it's Clarke who has risen most on draft boards and in the esteem of college basketball coaches during this season. A year ago, Clarke was watching from his dorm room as Gonzaga lost to Florida State in the Sweet 16. He was a late-blossoming big man who had transferred from San Jose State and was sitting out his redshirt year. This season he's been an absolute revelation, perhaps the most athletic player in Gonzaga history, giving the team a dimension they've never before had. "The one thing Brandon does, he always finds a way to get the ball up on the rim and his ball usually goes in," Few said. "It's an incredible luxury to have just such a talented, high-energy, high-motor guy … He's been unbelievable on the defensive end, which we knew he was going to be. But he's worked diligently and just put in tons and tons of hours, and he's been so coachable. Man, has he been so coachable and so willing to learn. Those are great combinations when somebody is working hard and they're coachable and then he's around a great, accepting group of guys who want to give him the ball." This may be Gonzaga's most talented team ever, and the second-most talented team in the country, behind Duke. They have this dominant frontcourt, a killer 3-point threat in Zach Norvell -- whose big shot with three minutes left stopped a Florida State run and put Gonzaga back in control -- and an experienced senior point guard in Josh Perkins. More than just talent, though, what Gonzaga has in its corner is a culture that knows what to do in those tough moments. "It's winning!" an animated Few said after the Sweet 16 win. "It's winning, man! It's the culture of winning! And, oh, yeah, the older guys teach the younger guys. This is what you do at Gonzaga. You win! There are those times in the game where it's in the first half when we're making a run or somebody is making a run at us like Baylor did, like Florida State did, and the older guys, sometimes they say something, and sometimes it's in their actions… That's just what winning does over the years."